We have four different Charming Totes patterns. 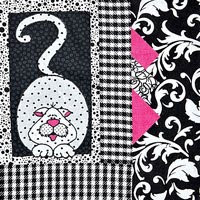 The patterns are designed to use those great 5" x 5" charm packs. Our first Charming Tote pattern was a huge hit!! Charming Totes pattern contains instructionas and templates for a large tote bag, scoop pocket tote, and a cell phone tote. Then we decided to add three more totes to the great line. Charming Totes 2, we added pockets by folding and layering the charms. There are three different sizes in Charming Totes 2 the large tote 18"w x 13.5"h x 4.5" d, medium tote 13.5"w x 13.5"h, and small 9"h x 4"w x 4"d.
Sue Marsh's newest fabric line is called Monsters in the Closet. 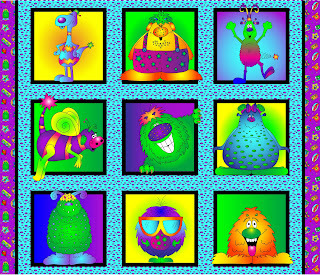 The fabric line consists of panels of her fun monsters, dust balls, stripes of all the monsters hanging out, monster hair and skin, and pictures of all her monsters tossed into the air. With this fabric line she created three patterns that look great in this fabric. 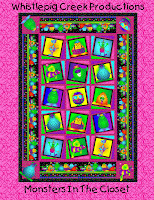 There is Monsters in the Closet Blue quilt, Monsters in the Closet Pink quilt along with Monster Spin. 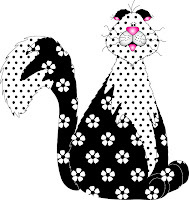 Whistlepig Creek Productions is a small business that sells fun and creative patterns for quilting, wall hangings, clothing, bags, and many other sewing activities. We have been in business for many years now and have decided to enter the blogosphere, Twitter, and Etsy. We currently have a website with our many designs http://www.wpcreek.com/ go check it out!!! Our goal is that our fantastic patterns will make you giggle!! !